I go silent for a week and a half, and a bunch of stuff happens. The OSR blogosphere (yes, I hate that Web 2.0 Newspeak as much as you do, but sharks die if they stop swimming*) has been blowing up with things regarding megadungeons, largely because of the perceived failure of James Maliszewski's Dwimmermount (truly, you're just best off reading about the whole debacle on The Other Side, because he gathers several of the salient links for your perusal). For my part, I don't really have an opinion on the matter. I supported the project, but I have no real issue with the delays ("Do you want the job done right, or do you want it done fast?"). And I don't have an opinion on the "empty space" thing because I haven't read the digital materials Autarch has been releasing, mostly because I've just been that busy. Anyway, this is humorous because I received several parcels on Monday. 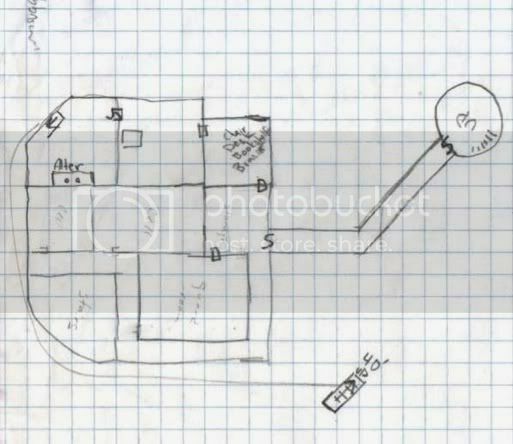 One was a blotter pad of graph paper so I can start sketching the first few levels of my Carcosan megadungeon. Another was a miniature of a Kolyarut (here's the D&D 3.x version and the Pathfinder version) whom I plan on using to represent a Planar Trade Consortium agent with business regarding that very same megadungeon. Finally, my copies of Barrowmaze I and II arrived that very same day. I haven't had the chance to read through them yet, but still, megadungeons. I'd initially contributed to the Kickstarter (at the PDF level), but ended up asking for a refund after they released the revised schedule that pointed to it maybe being ~a year late. Late is one thing, but it's on target to be between 6 and 12 months late, and that's a whole other thing. The one piece of discussion that seen much of is the difference between the game as run by JM and the game as run by not-JM. This was all kicked off by someone who's not JM running Dwimmermount and the players finding it disappointing... to which people responded, "Yeah, but it's great when JM runs it!" I don't doubt that, but they're nonequivalent.